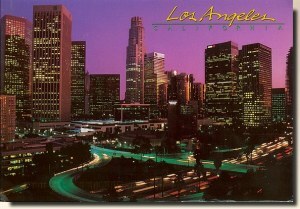 Los Angeles is the most populous city in California and the second most populous in the US, after New York City. The Los Angeles coastal area was first settled by the Tongva (or Gabrieleà±os) and Chumash Native American tribes thousands of years ago. The first Europeans arrived in 1542 in an expedition organized by the viceroy of New Spain and commanded by Juan Rodrà­guez Cabrillo, a Portuguese-born explorer who claimed the area of southern California for the Spanish Empire. However, he continued with his voyage up the coast and did not establish a settlement. The next contact would not come until 227 years later, when Gaspar de Portolà , along with Franciscan missionary Juan Crespà­, reached the present site of Los Angeles on August 2, 1769. Crespà­ noted that the site had the potential to be developed into a large settlement [wikipedia].